Everyone needs a fast meal sometimes. You know, you have a million things to do and there’s that rumbling in your belly – and cooking for even 15 minutes seems like wayyyyy too long? That’s when quick and easy foods like falafels from Falafel Republic are the ideal go-to. We’ve tried both the roasted garlic and traditional falafels – they’re good cold or warm. And of course, they make an incredibly tasty wrap, especially with some hummus and veggies thrown into the mix! These tasty little patties are vegan and made in the USA. They’re loaded with real ingredients, too like chickpeas, fava beans, spices, parsley and minced onion. Mmmm… The company is based in Massachusetts and even has gotten air time on The Today Show. Which means they make a yummy falafel, you know? We loved the “about us” page on Falafel Republic‘s website: The Falafel Republic is a borderless group of supporters who subscribe to no specific ideology other than the enjoyment of falafel and to exploit it’s versatility in their quest for good food. 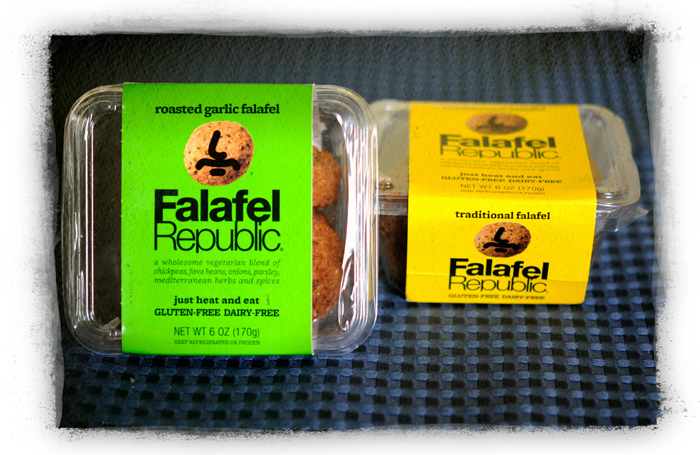 The following meal and snack solutions show how members of The Falafel Republic are covering the globe one bite at a time. Sounds good to us. We picked up our Falafel Republic falafels at a local grocery store chain in the deli area, right next to the hummus, and according to the website, they are available nationwide. 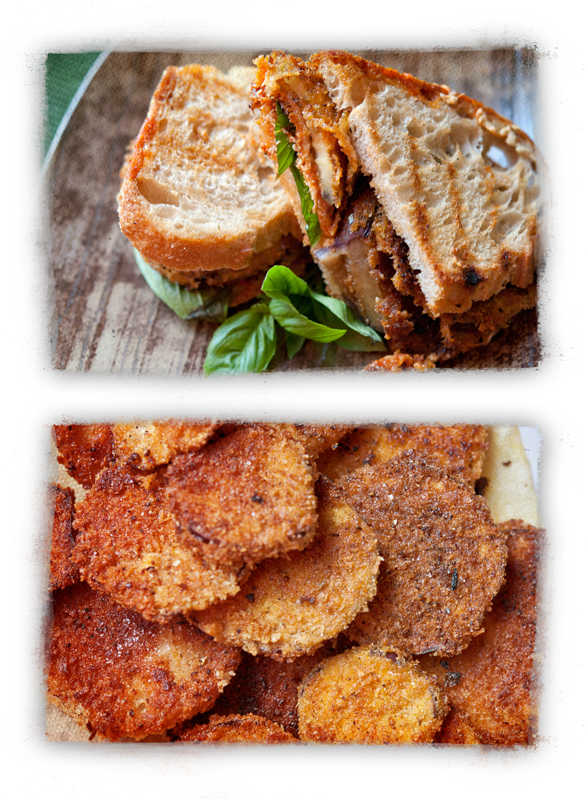 So grab some next time you’re shopping – they’re a great fast lunch or supper – flavorful and filling! 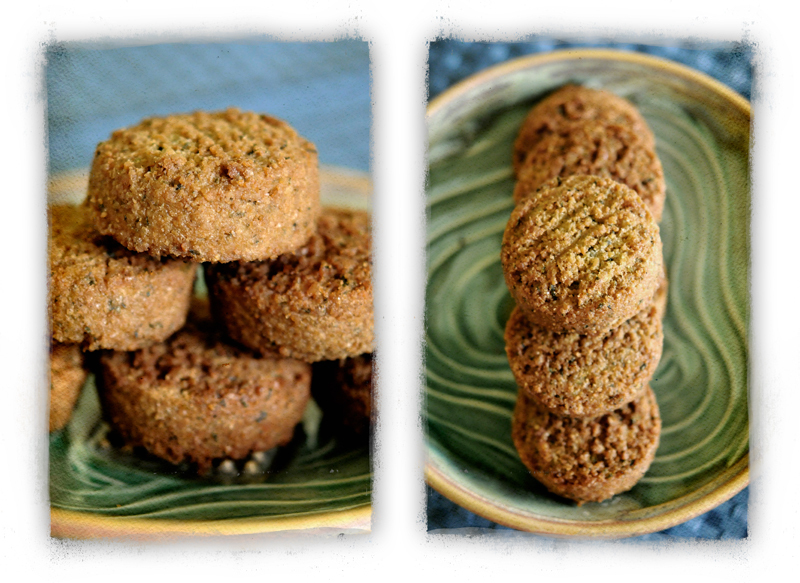 Oh, and their website and Facebook page are both loaded with falafel recipe ideas, in case you have more time to cook! We were in Wegman’s and among the apples, I found a produce bag with two eggplants. These little guys were deserted, left behind in the fruit. Peeking into the bag, I saw they were perfect eggplants – firm, shiny, deep purple. So, we added them to the cart and they came home with us. In the meantime, I wasn’t sure what to make with them. We both like eggplants, but don’t have a lot of recipes that feature them. I was flipping through an Everyday with Rachael Ray magazine and saw the recipe that inspired this meal: Eggplant Parmasean Sandwiches. Rachael’s version included eggs, milk and two kinds of cheese, not to mention that we didn’t have hoagie rolls or fresh oregano. But we adpated and made this delicious offering. We called them “Sammies” since that’s what Rachael often calls sandwiches on her shows. Before you grab your cutting board, be forewarned that this is not low fat. It’s fried and has all the usual decadence of real eggplant Parmasean – just with a vegan ingredient list. Enjoy your indulgence! Skin eggplants if preferred (we don’t, but if you want to you can!) Slice eggplant into 1/4-inch thick discs and lay out on a cookie sheet. Sprinkle with salt and cover with a paper towel for about 15 minutes. Meanwhile, in a shallow dish, combine breadcrumbs, dried oregano, paprika, garlic powder, dried parsley, nutritional yeast, salt and pepper. Mix to combine well and set aside. In another shallow dish, mix Eneg-G Egg Replacer powder with arrowroot and water. Use a whisk to really get the lumps out. The resulting liquid will be thick, almost gooey – but it should be smooth and not lumpy. This stirring may take a few minutes. In a heavy bottomed pan, heat some oil to fry the eggplant over medium heat, about one centimeter deep. We prefer to fry in cast iron, but anything sturdy will work. Thin pans will need less heat, as the outsides will burn before the eggplant is cooked through. Oil should be warm when you begin, but not boil. To assemble, dip each eggplant slice into Egg Replacer/arrowroot liquid on both sides, then coat in the bread crumbs and slide carefully into hot oil. Be mindful not to splash it in, or you can burn yourself. The eggplant will cook about 2-3 minutes on each side, until golden brown. When both sides are evenly crisp and brown, remove from oil and place on a plate with paper towels to absorb extra oil. Repeat with all eggplant discs and be sure to replenish your oil as needed for frying. When you’ve cooked the eggplant, you’re ready to assemble your sandwiches. We made ours in a panini press, but you can warm them in a second pan (with way less oil!). On six slices of bread, layer eggplant slices with a few spoonfuls of marinara, fresh basil leaves and a few sprinkles of mozzeralla-style Daiya. Top with another slice of bread and warm through in a pan or panini press until Daiya is melty and bread is toasted. These are best when eaten warm and fresh! Other sandwich fixins that might be good with this include pesto, fresh tomato slices, onions, peppers or more nutritional yeast! Our greyhound is particular. Since the day we picked her up from Greyhound Rescue, she’s gotten used to baked homemade treats, fresh food, a wardrobe of fancy collars and as many comfy spots to snooze as any dog could hope for. She literally has seven dog beds. It’s a bit excessive, I admit. But, when it comes to eating, she is the most finicky dog I have ever crossed paths with. We don’t know if it’s from all the home-cooking, or if she was born that way. When this hound doesn’t like something, she walks away from it. She will go hungry before she will even consider eating food she doesn’t find up to snuff. Oh – and we have had very little success getting her to eat any sort of bought kibble. Ever. No matter how costly, organic or wholesome it was. When some nice folks at the Baltimore Veg Fest handed us a sample of V-Dog kibble, we took it, but didn’t anticipate results of any kind. After all, it’s a daily dance to get our hound to eat anything, nevermind kibble. We sat it aside until recently. Imagine our surprise when she devoured, literally, every bite of V-Dog. She was standing there rattling the dish for more. 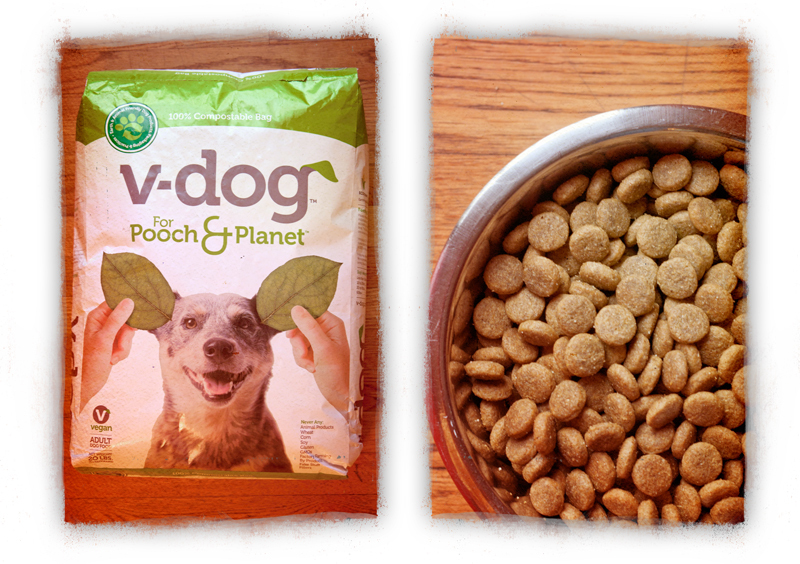 Turns out V-Dog is a 100% vegan dog food, made and sourced in the USA by a family-owned company. V-Dog is committed to making the 80-million companion dogs in the country more eco-friendly, because a vegan dog, like a vegan person, has a much lighter footprint on the Earth. And as impressive as it was to see our greyhound gobble up the kibble, we were equally impressed with V-Dog‘s ingredient list. No corn, no soy, no gluten, no wheat. It’s protein comes from peas, lentils and peanuts as well as a host of whole vegetables and grains like brown rice. In fact, you can read the ingredient list online and recognize all the good stuff in each bag. Speaking of the bags, they’re even biodegradable. Impressive. If you have a dog, you should check out V-Dog. Don’t look at your local pooch boutique though – it’s only available online for now. We tried – we literally called every pet store in a 50 miles range and no one had heard of it – but hey, they have now, thanks to us requesting it. That’s one way to spread the word about this awesome dog food. So get over to the V-dog website and pick up a bag for your best friend. If our dog likes it, there’s a good chance that yours will too. Cuz what canine doesn’t love kibble that smells like peanut butter treats? Ladies, we’ve talked about these vegan, eco-friendly brushes before, but when I saw this Limited Edition set of Kabuki Brushes from EcoTools, I had to share. The handles are made from recycled aluminum and the bristles – which are sooooo soft – are animal-free. There are four brushes in the set: concealer, bronzer, contouring and buffing. And I’ll admit, I’m not a make-up artist, so to me the specific shape/use all becomes either “powder” or “bronzer” for my purposes. 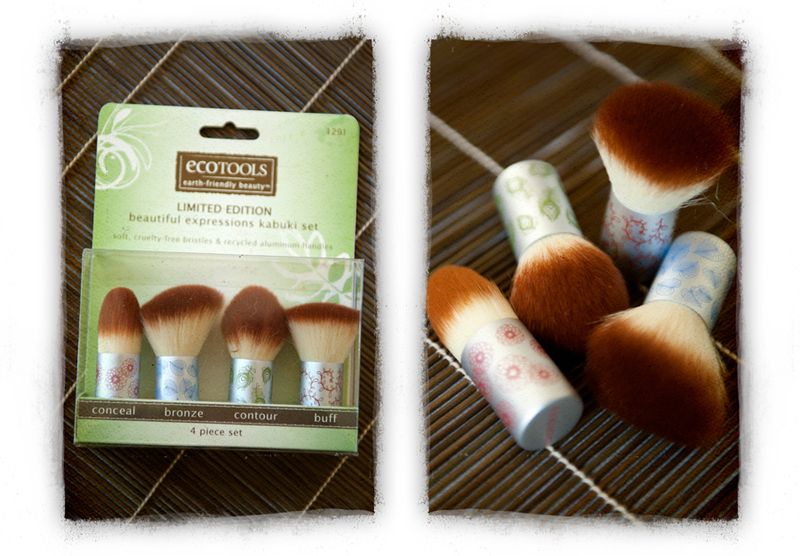 EcoTools calls this the Beautiful Expressions Kabuki Set. They are really adorable. Pick up a set at Ulta, Wegman’s, Target or Amazon.com.